PANZERKAMPFWAGEN III (sdkfz 141) in 1/15 scale. 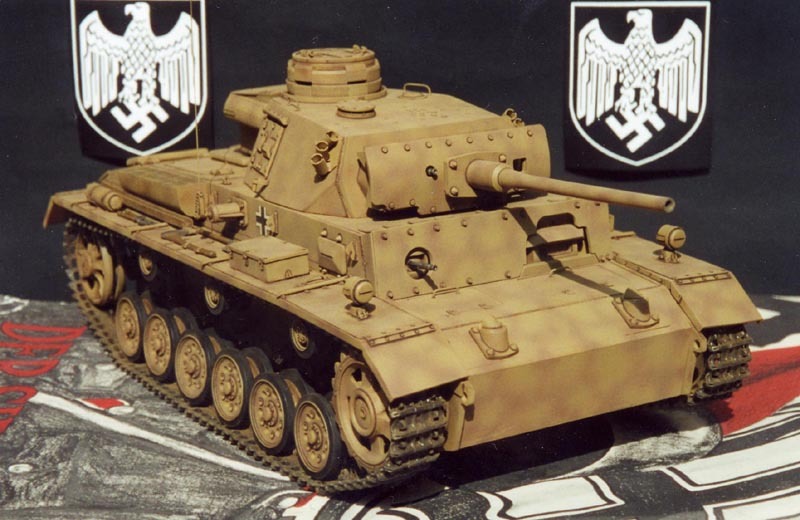 The Pzkpfw III emerged as one of the formative images of German military success in the Blitzkrieg victories of the early war years, technically, the Pzkpfw III was a well-balanced basic design which left provision for up-gunning and up-armoring, but by 1942 it was incapable of further modification that would enable it to keep pace with the spiral of the gun/armor race, During the high years of Blitzkrieg however, it was the only weapon in the German tank arsenal that really counted, and thus, it did not merely witness history in the making, ------it made it. From the channel coast, to the Volga, and from the Artic, to the North African Desert, This vehicle enjoys a permanent historical significance in association with Germany�s PANZERWAFFE, which was in effect, an army within an army that led to the creation of a LEGEND.